The Jarvis Model HTC-80 — hydraulic powered toe cutter for hogs, sows, calves, and sheep. 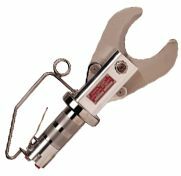 Robust, powerful tool for removing hog and sow toes or feet as well as cutting hocks on calves and sheep. Blade opening 3.1 in (79 mm). Fast cutting, only 0.7 seconds per cut. Clean cutting – no splinters, no bone dust. Special hanger – the HTC-80 can be used vertically or horizontally. Excellent in both positions; makes work easier. Blade guard is mountable on both sides for left or right handed operators. The HTC-80 is virtually maintenance free, for long trouble-free life. Lightweight – only 10.6 lbs (4.8 kg).